It seems to be quite late for me to actually talk about Time Machine. To be precise, I will actually start using it for real. I have tried several time, but didn't see the needs of it until this time that I accidentally remove some wrong files (2GB) Yes I did it by mistake, and could not recover anymore, no matter what method. That silly mistake would be fixed easily if I was not too lazy to pull out my external drive (Lacie 500GB) and the FireWire Cable. The Process that I did was quite simple. 1. Clear up all old back up files that I had. a) Time Machine - It prompted to me first time I tried Time Machine that I need at least exactly the same size as the original source, in this case I need around 260 GB as my Mac has around 250 GB space. b) General Backup or usage that most external portable drive does. 5. Either Wait for the Backup to start within few hundreds of seconds, or manually click Backup now from the top bar. By default, Time Machine backs up everything on your Mac. If you want to exclude certain files, just go to Time Machine preferences, click Options, then select the folders you wish to skip. Want to delete all instances of a file or folder previously backed up? Easy enough. 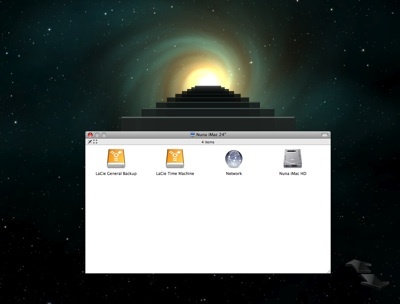 Launch Time Machine, select the item to be deleted, then choose "Delete from all backups" from the action menu in the Finder toolbar. My Preference would be to exclude all File Systems, Applications, and other Home Directory that I didn't use. Most important to Backup for me are my Home Folders... which including Photos, Documentation, Music, and etc. That's it! Done!... Now I will have to wait and see what happen next.